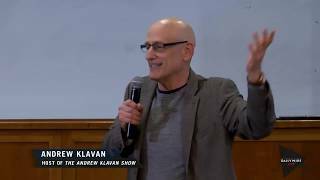 Andrew Klavan is the author of such internationally bestselling crime novels as True Crime, films by Clint Eastwood, Don’t Say A Word, films starring Michael Douglas and Empire of Lies. Stephen King called him “the most original novelist of crime and suspense since Cornell Woolrich.” He has been nominated for the Mystery Writers of America’s Edgar Award five times and has won twice. He has also won the Thumping Good Read Award from WH Smith and been nominated twice for the Bouchercon’s Anthonys. His books have been translated around the world. His most recent book is a memoir of his religious journey The Great Good Thing: A Secular Jew Comes to Faith in Christ. His most recent work of fiction is the serial fantasy-thriller podcast Another Kingdom, available on iTunes and other podcast venues.